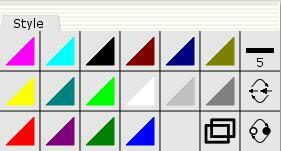 The style tools are used for underlining important net structures with colors, line thickness, etc. to improve readability. None of these tools have any semantic effect on the net. Most of these tools change the style of all elements in a group or on a magnetic guideline when applied to one element in the group or to the guideline. See more on the groups and magnetic guidelines pages.